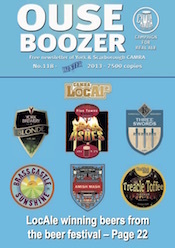 This entry was posted in OB118, Ouse Boozer, Ouse Boozer Magazine on 26th November 2013 by York CAMRA. 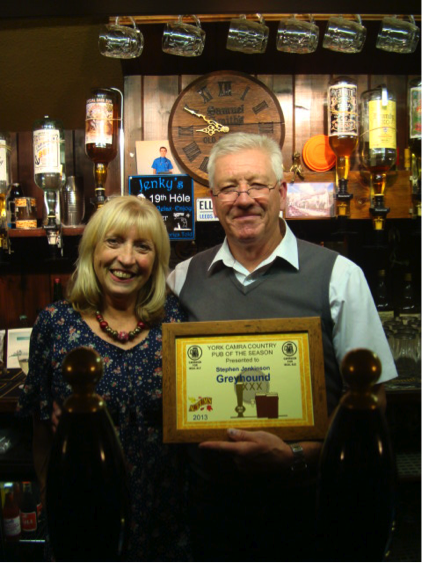 The Autumn Country Pub Of the Season was the Greyhound at Saxton. On Thursday October 24th a full 16 seater bus left York at 7pm. I was excited, looking forward to visiting one of my favourite haunts and not having to drive. 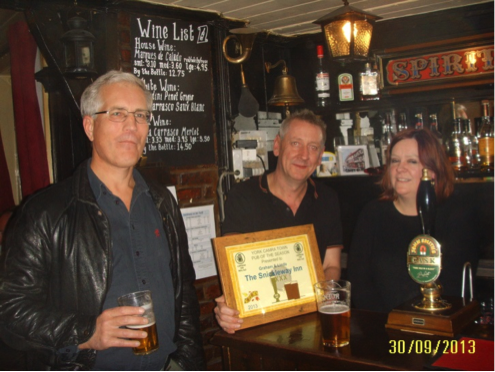 For some of our CAMRA members it was their first visit to the Greyhound. From Tadcaster, we approached through the darkness passed the famous Battle of Towton battleground and arrived in the tiny village of Saxton. Being easily missed, the bus driver drove right passed the pub, much to all our consternation as we were all ready for our pints! We were not disappointed once inside; the little pub was brimming with locals, two blazing coal fires adding to the warm atmosphere. Steve was ready for us and had three bar staff waiting to serve our queue that stood in the tiny bar and along the stone flagged corridor. Very soon everyone was served and busy exploring the knick knacks around the pub and looking for a seat. 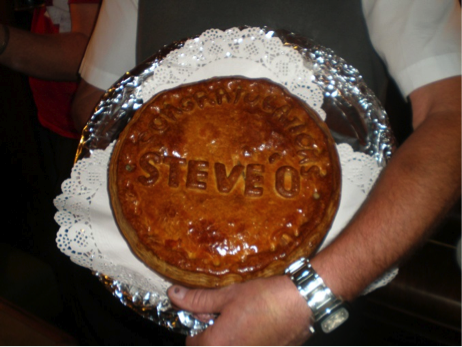 The award was presented to Steve to say thank you for doing an excellent job at running this special pub. Steve has been landlord over two years and has put his life and soul into the job. He is a very dedicated and most accommodating manager who welcomes everyone. There are many local meetings, including Friends of the School, Cricket Club and Battle of Towton committee that enjoy the atmosphere which Steve provides in this well-run little pub. Being a Sam Smith’s pub, the only cask beer is Old Brewery Bitter, which is always on top form, and at the usual very reasonable price. I think Steve’s previous job as a drayman taught him something about how to keep beer. This entry was posted in OB118, POTS, Presentations, Pub News and tagged Greyhound Saxton on 26th November 2013 by York CAMRA. A good selection of members assembled at the Snickleway Inn for the presentation of the Autumn Town Pub of the Season award. We were greeted by an inviting fire from the back bar which gave a truly autumnal feeling to proceedings. On the bar was the expected array of excellent ales: Roosters Yankee, Jennings Snecklifter, Rudgate Frightfully Pale, Theakston’s Infallible, Treboom Kettle Drum plus John Smith’s Cask. Chris presented the award to Graham and Linda, thanking them for their impressive work over the last few years in keeping the Snickleway right up there as one of the city’s most pleasant pubs. This entry was posted in OB118, POTS, Presentations, Pub News and tagged Snickleway on 26th November 2013 by York CAMRA.